And ended with snacks and drinks and a long talkative late lunch/tea at a South Bank open-air cafe/restaurant, several tables brought together, Auntie consuming several glorious large cups of tea and cake, young appetites enjoying food, and a grand time...finally as dusk fell I headed home and they varioouslky to pubs and parties...a happy day. and here, also checked against delivery, his speech to the Council of Europe. I am honestly at a loss to find anything derogatory about grannies in either. Co-author Clare Anderson and Auntie meet here from time to time to work on our next book/TV feature/other projects. The team behind the bar know us:"How's the book progressing?" "Did the trip to Poland go well?" Today, over fish pie and gin-and-tonic we got to grips with our next (EWTN) TV venture, which involves a good deal of planning and will be filmed (DV) next summer. ...one of the silliest things I have yet read is a criticism of the Pope in The Guardian for his recent poignant message to Europe at Strabourg, when he noted the continents tragic infertility and absence of new life. The writer, a self-styled Catholic Feminidst announces that this is an attack on grandmothers. I thought it was a spoof at first. No, I'm not giiving the link: some things are so daft it just isn't worth encouraging anyone to go there. ...London burned like rotten sticks". Children are still being taught history by using that rhyme - my small great-niece recited it to me the other day when I told her that I was about to lead a special History Walk in London exploring the route of the Fire. Our Walk this evening will finish with Evensong and Mass at Precious Blood Church, across the river. The Fire stopped when it crossed London Bridge, as there was a firebreak on the south bank, in the form of open land beyond the bridge before the houses and shops and pubs of The Borough. ...prizewinner Maddie Carling of St Mary's School Bishops Stortford with her parents and Mgr Keith Newton at the 2014 TOWARDS ADVENT Festival. She won a cash prize, a Missal (CTS, hardback, ribbons - something to keep and use for always) and books including, yes, Auntie's book on St John Paul the Great. Do children in Britain today know the Lord's Prayer? Often the answer is "Alas, no." No reason to assume this should be permanent or acceptable. ...we were unable to have the planned Procession of the Blessed Sacrament in honour of today's feast of Christ the King, rounding off the Church's year. All the Sunday school children had been taught about Christ the King and made crowns to wear for the procession, so wore them for Benediction in the church instead. ...from the choir of the John Fisher School, a splendid welcoming ceremony with Mgr Keith Newton of the Ordinariate of Our Lady of Walsingham, a hall filled with stalls and displays from a great range of Catholic groups and organisations, and lots of freshly-brewed coffee and delicious cakes and sandwiches to great people as they arrived...the 2014 TOWARDS ADVENT Festival was by any measure a really wonderful day! It seems extraordinary to reflect that it is our 15th Festival. Standing on the platform at Westminster Cathedral Hall I was suddenly conscious of the great adventure it has all been. When I first chaired a gathering of various Catholic groups (Aid to the Church in Need, Fisher Press, the Catholic Truth Society, the Catholic Writers' Guild, Gracewing Books) to discuss the possibilities for such a Festival, we did believe that we were on to something worthwhile and rather exciting. And we've been proved right - but I honestly don't think that we realised just how deeply and confidently it would become embedded into the life of the Catholic community in London and its suburbs, or how easily it would adapt to the many and swift changes of the past decade and a half...the internet, swift desktop publishing, mobile phones, two changes of Pope, and the arrival of some wholly new things on the Catholic scene including the Ordinariate, a new translation of the Mass. 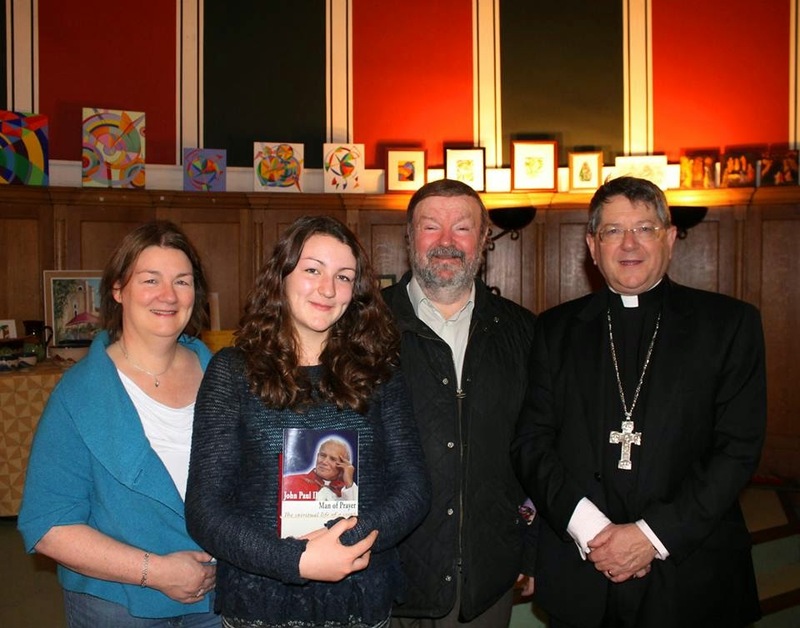 The organisers of the 2014 TOWARDS ADVENT Festival have pleasure in announcing the winners of the St John Paul/St John XXIII Essay Project, organised in association with the Festival. GEORGE EZEKIEL and MADDIE CARLING of St Mary's School, Bishops Stortford, Hertfordshire. The prizes will be presented tomorrow (Sat Nov 22nd) at the Festival at Westminster Cathedral Hall by Mgr Keith Newton of the Ordinariate of Our Lady of Walsingham. George and Maddie win a cash prize of £50 each, plus a commemorative Missal and other book prizes. Runner-up prizes were gained by other pupils at St Mary's, and by pupils at St Augustine's School, Ealing. These will be presented in ceremonies at their schools over the next few days. The Project was open to pupils at Catholic secondary schools in the diocese of Westminster, to mark the canonisation of Saints John Paul and John XXIII. We were impressed by the standard of entries and are glad to have played a part in enabling young Catholics to mark this very special year in the life of the Church. "... compassion for those who choose to live differently should not inhibit us from being advocates for the single most humanising institution in history. The family, man, woman, and child, is not one lifestyle choice among many. It is the best means we have yet discovered for nurturing future generations and enabling children to grow in a matrix of stability and love. It is where we learn the delicate choreography of relationship and how to handle the inevitable conflicts within any human group. It is where we first take the risk of giving and receiving love. It is where one generation passes on its values to the next, ensuring the continuity of a civilization. For any society, the family is the crucible of its future, and for the sake of our children’s future, we must be its defenders." of Great Britain ...has been working to help support and encourage Catholics in public life in Britain for somegthing like 150 years. The Annual Meeting began with Mass in Westminster Cathedral and then a gathering in nearby Vaughan House. The President, Lord Brennan, gave his retiring speech - he is handing over to Sir Edward Leigh MP. Lord Brennan has been an excellent President, and Sir Edward's strong and lively address gave us all a sense of confidence in the future. There is certainly plenty to do...the meeting was well-attended, the spirit good, but....oh my goodness there are grave issues facing us all and the mood when we tackled these was serious. Deliberate killing of the gravely ill. Imposition of a secularist agenda on all schools. Pressure on Christian doictors and nurses to accept gross and unethical procedures. Lively talk over drinks and sandwiches...plans for 2015, no sense of abandoning hope or shrugging off the future as beyond our care. The chairman is Councillor Robert Rigby, of Westminster City Council. Auntie is on the Education and Outreach Working Party. Among many other activities, there is a public lecture sponsored by the Catholic Union on Dec 4th, 6.30pm at the University of Notre Dame, Suffolk Street, just off Trafalgar Square. Topic is Catholic education. Worth attending. ...the winners of the special St John Paul II/St John XXIII Project will be announced. This is an essay project, a new venture for the TOWARDS ADVENT Festival. Pupils at Catholic secondary schools in the diocese of Westminster were invited to write essays about one or both of these great Popes, focusing on the question "What is a Pope?" and showing evidence of understanding the role and purpose of the papacy. We have two winners, a boy and a girl, and each will recieve a £50 cash prize and a beautiful Missal. There are runners-up who will also receive Missals (for those of special merit) or other book prizes. There were some good entries - choosing winners was not easy. I am encouraged by the work produced in some of our Catholic secondary schools. "Jesus Christ appointed Simon Peter the first Pope, 'You are gthe rock and on this rock, I shall build my Church.' This means that the Pope is the Supreme Pastor which means he represents Christ's love and concern for every living being. All Popes are successors and descendants of Peter, although they are not blood descendants, they carry on Peter's work of spreading the good news across the globe." Gleaming chalice and glittering candles, a great church filled with people praying, voices saying the Lord's Prayer, a choir singing "Lux aeterna luceat eis Domine..."
...in a cafe near Westminster Cathedral, a cross and sullen horde of youngish people, some with balaclavas covering their faces, is shouting outside. They are carrying placards: one says "F--k fees" and another "Free education tax the rich". What a depressing and horrid group of people they appear to be. I am particularly nauseated by the sight of anyone trying to look like a terrorist with a face deliberately kept hidden by a black balaclava (I hope he is uncomfortable - it is warm and mild day, unsuitable for such gear). But above all, how sad it is to see a generation, the most expensively educated in our history, given every advantage and heirs to a freedom and prosperity unknwon to previous generations, ranting and complaining in this sullen way. Thomas Aquinas, all part of my post-graduate studies in theology. Loving it. The university of course teems with young people, and when I drop into the refectory for some coffee and a piece of cake, there are vast crowds tucking into burgers and beans and chips. The college specialises in sports-related things, and also in theatre studies... all this gives a great sense of pace and energy to the place. At the post-grad theology level, there is energy too, though it's rather different - a real sense of zest as we study. We're a mixed group - a great range of races and ages. We include several priests, a deacon, a young teacher, a cheery nun, a young seminarian from India who has just flown home for ordination...and Auntie, who alas had ti hurry in late yesterday, following a family hospital visit. But I felt involved as soon as I sat down, and was soon deep in Aquinas :"...I answer that..."
...an embroidered picture of St John Paul the Great. Quite hard work, in petit-point. The idea is that we will carry the picture on the John Paul Walking Pilgrimage to Walsingham next summer (Aug 6th-9th...put the dates in your diary, and come and join us! Info here). So...I thought I'd take the picture to the TOWARDS ADVENT Festival on Saturday at Westminster Cathedral Hall, and get it blessed by Mgr Keith Newton of the Ordinariate of Our Lady of Walsingham! So you'll see me on the platform with him on Saturday...come and be there to share in it all...and please be polite about my embroidery: it may not be the most perfect piece of artwork, but it was done with love and enthusiasm! ...Auntie's next Catholic History Walk - the final one of the year - here. ...“Children have a right to grow up in a family with a father and a mother capable of creating a suitable environment for the child's development and emotional maturity"
Pope Francis, speaking today in Rome. Do you realise that if he was a Government minister, or a Mayor of a major city, or a senior police officer, or a judge, and he made the above statement in Britain today, he would probably be hounded out of office? THANK GOD FOR THE POPE! Having a Christian leader who can speak out in this way is a guarantee of some freedom of speech. More on his speech here. But he is only saying what everyone, down all the generations, has always and everywhere known to be right and true. ...the traditional prayer for the Queen, sung at the end of Mass. The subject came up on this Blog recently (see below, a few days back) and by coincidence - Providence - I went to Mass on Sunday at a church I don't usually attend, and it was sung, and beautifully. It is sung there every Sunday at 11 am Mass. Interestingly, almost eveything is sung at this Mass, including the Confiteor, and it works well. I used to attend this Mass regularly, and always loved it - the choir is now even better and the congregation has perhaps also grown, although it was always large. ...Tyburn Convent which stands as a place of prayer, penance and reconciliation on the site of the old Tyburn Tree (see below). ... the site of the ghastly Tyburn Tree where for many years people were hanged,on a vast triangular gallows that could take several victims at once. People gathered in vast crowds to watch, and there are descriptions of them doing so, bringing packed lunches and with jugglers and musicians to entertain them during the wait for the victims to arrive from Newgate, Sometimes the victims were very young Sometimes they were swindlers or had forged coins, and were unpopular as swindlers and forgerers are today. Sometimes they were good-looking or behaved with remarkable courage, and so got a cheer from those watching them writhe and choke and die. Sometimes they were members of a religious body deemed to be a threat to the State (including of course, the RC Church), and sometimes they were thugs or murderers. Hanging - and in some cases mutilation and butchery while still alive after a partial hanging - was a public spectacle that drew immense excitement and people travelled long distances to watch it all. Nor does there seem to have been any opposition to the notion of families spending a day in this way: along with watching public burnings at the stake, it was apparently an acceptable way for a Christian to spend a London afternoon. Next time you are told that we are living today in a particularly gross and horrible era, remember that. On Monday Dec 8th, one of our young members, Daisy Powles, who walked to Compostella on a traditional walking pilgrimage this summer, will be telling of her adventures. Come and enjoy the talk, and the hospitality of LOGS...6.30pm, St Mary's Church, WEST CROYDON. Papa Francis is keen to have prayers after Mass for the persecuted Church: the St Michael Prayer (of which he is particularly fond) and the "Hail Holy Queen". This seems a good idea. For some years there were "Prayers for Russia", but they were often said in a great rush with a let's-get-this-over feel. A revival would benefit from the gap: there would be a sense of freshness, and of urgency - the prayers would feel intimately connected with the tragic news that we hear almost daily of the savage persecution of Christians. The Bidding Prayers enable us to have public prayers for specific issues. When they were first introduced they were structured, and worked well: they almost invariably included one for the Queen (which we'd not had as part of normal parish Masses in Britain before) and for those in public office, and for the poor, and for various other needs at home and abroad. Then things went through a very messy stage when some priests would say "Does anyone have anything they'd like to pray about?" which invariably produced awkward silence or some mumbled and incoherent plea, or some statement about a fashionable cause.. Dreary. Now the trend is towards formal Bidding Prayers again. Of course the persecuted are often - in recent months always - mentioned. But something specific after Mass would be very much in Papa Fr's style. If it happens, you heard it here first. ....in the world has more than tripled over the last century. Did you know that there are now nearly 1.1 billion of us? As in "So, I was at uni and uwwa zyke 'where's the party?' and then uwwa zyke 'yay, it's cool' and uwwa zyke..."
Or: "So I got this job and uwwa zyke ' yay, it's OK' but then uwwa zyke late and uwwa zyke dunno what to do..."
"Ahmlyke buying some, like, boots and ahmlyke, yay, wicked, but ahmlyke, they're, like, wild, and ahmlyke, will they, like, fit? And ahmlike, whatever..."
There is still time for all young Catholic Londoners of secondary school age to take part in the SS JohnPaul and John XXIII essay project...details on that link. ...in the blood-red sea at the Tower of London bring more and more people every hour. Each night, the Last Post is played and 180 names are read out, from among the over 800,000 British and Commonwealth dead from 1914-1918 commemorated there. Something has happened in London over these past few days. Remembrance Day means more this year. There are of course poppy-sellers everywhere, some of them young men and women in uniform - cadets from the three services - and the sight of young people formally attired in this way is so unusual and striking that it makes the whole of a crowd at a railway station or on a busy street look different, somehow. Others sellers are Chelsea Pensioners, or of course simply kindly volunteers of the type you find helping in charity shops or at church events or local fetes and fairs. We are conscious of a friendly and open-hearted Britain that we do not often see, of formal clothes that have a formal meaning, of time given without financial reward, of goodwill and of a sense of common purpose. It isn't the usual London. Won't last, of course. But even the dismantling of the scarlet sea - there are over 8,000 volunteers to clean and pack and post the poppies to their owners - will mean something. And we have joined together in something bigger than ourselves, and found a bond with our history that stirs our souls and links us to ideas and ideals we do not often think about and sometimes feel we are no longer allowed to discuss openly. ... waiting in the queue for confession this week at Westminster Cathedral, each of us kneeling or sitting as the mood and need for prayer or reflection took us. Meanwhile, in the main body of the Cathedral, the magnificent Annual Requiem Mass for the Catholic Police Guild was taking place. Impressive sight: rows and rows of policemen in their dark uniforms, and a Guard of Honour carried a (proper, bobby's) helmet up to the High Altar. As Mass ended, the Last Post heralded two minutes of silence. No problem - we penitents were already silent. Then Reveille. Then...the familiar sounds that herald the first notes of the National Anthem. My knees automatically unbent and I rose, as with a reflex action, the music simply making it happen. "Sorry" I murmured to the chap next to me. "I fear I am constitutionally unable to remain kneeling or seated for this one. " And so we stood. What's the etiquette? Does one rise for the National Anthem while waiting for confession, or does the need for a suitable posture of prayer before sacramental absolution take precedence? So far, all those with whom I have discussed this say "Stand". Auntie has never yet remained seated while The Queen is played and cannot imagine ever doing so. Meet 5.30pm (NOTE TIME) at Precious Blood Church, O'Meara Street, London SEI. Nearest tube: BOROUGH or LONDON BRIDGE. The next Evening of Faith will be on Tuesday Nov 18th and will tackle the topic of contraception and holiness. A good follow-up to the discussion about the Synod. is today, November 1st, but our poor Bishops think that no one could possibly want to celebrate it, so it's been merged into tomorrow, Sunday. stage-set for "let's celebrate Hallowe'en - here's how to do it!" This is absolutely the right time for us to be saying "Yes - and it's ALL SAINTS TOMORROW, and ALL SOULS AFTER THAT! Fantastic opportunity to engage with the culture. Ghosts and ghouls and children having fun - all part of an ancient tradition recently revived (albeit sometimes in horrible and lurid forms). Let's engage. Let's celebrate. Let's evangelise . But no. Our poor dear Bishops think that...er...well...er...let's not have All Saints, let's just tell people to mark it on the next Sunday. Downplay it. Muddle it. Make people feel it's been "abolished". Have no answer when people say "So what's Hallowe'en then? When did Hallowe'een start? " and similar questions. Run away from the culture. Try to ignore it. Heads in sand. It is all the sadder this year, because All Souls Day has to be moved to Monday anyway (ie, it would do so even without the move-All-Saints stuff). PLEASE MAY WE HAVE OUR FEAST-DAYS BACK? explained that, when a feast-day is moved to a Sunday, most people simply think it's been "abolished". They go to Mass on Sunday, and honestly don't notice that the readings etc are for a feast-day. His response: "Do they not read their parish newsletter?" No, dear Bishop, they don't. Of course they don't. Some may browse it during the homily. Some (devout) people might take it home and have it handy for checking weekday or confession times. Some might - might - take note of some forthcoming event such as the Christmas Bazaar. But the idea that most will even remotely connect the newsletter with "Oh, so it's All Saints Day then! How splendid! A really important feast" is just pathetic wishful thinking. THE WAY TO HELP PEOPLE UNDERSTAND ABOUT ALL SAINTS' DAY IS TO CELEBRATE IT ON ALL SAINTS' DAY.